Hopper Capacity Approx in Kg: For Seed - 55 Kg. For Fertilizer - 65 Kg. Weight Approx in Kg: 385 Kg. 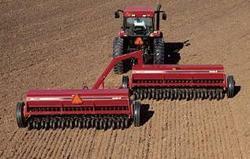 - The roller is use to push the seeds in drills. - It is very easy to adjust the seed measuring blades . We are a Leading Manufacturer of this Product.we deal in good quality product. Backed by our prosperous industry acquaintance, we offer an extensive range of Seed Drill Machine. 1. It does minimum tillage of the field & thus increase the yield. 2. Depth of seed sowing is controlled by the two wheels. 3. The tine are designed so to make efficient use of tractor power. 4. It is a available in 11 rows, 13 rows & 15 rows. Being a well-known entity, we are engaged in offering a broad series of Agricultural Tractor Seed Drill to fulfill the necessities of our customers.